On Friday I drove down to Poole, to swim in the sea with the lovely ladies – and two gentlemen – from Beyond the Blue. The weather came out to play, too. Used to the silty Bristol channel, the greeny-see-through waves were a delight. Late November, and we splashed about in the waves like it was high summer. Except, of course, for the quantity of woolly hats and scarves that appeared afterwards… but then again, this is England: woolly hats are hardly ever out of fashion. 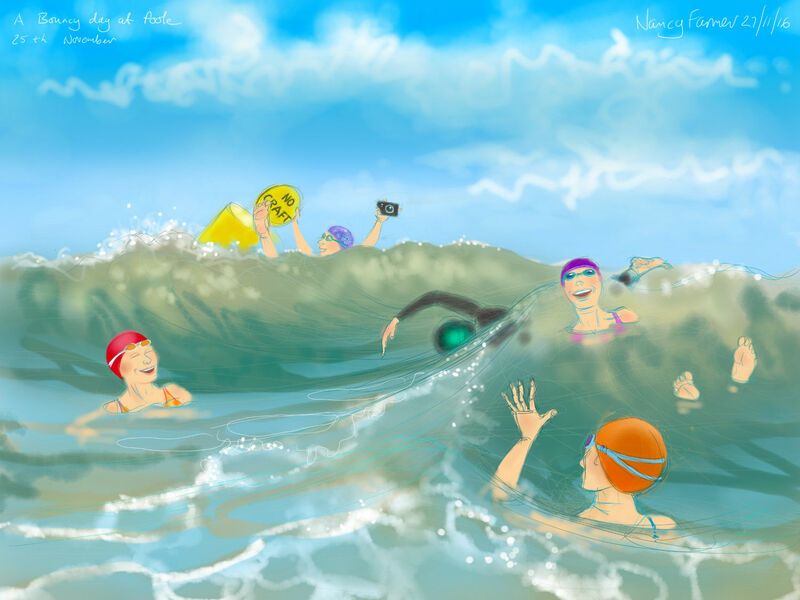 This entry was posted in showcase, swimming and tagged art, cold water swimming, drawing, open water swimming, Poole, sea swimmers, showcase, swimming, swimming drawings on November 27, 2016 by Nancy Farmer. What a fab piece of art. You are so clever.